During June, July and August, Go RV and Edmonton-based blogger Frugal Mama teamed up to bring you the RV for a Week contest, where Albertans had a chance to win one of Go RV’s fully loaded RVs for a week of their choice. 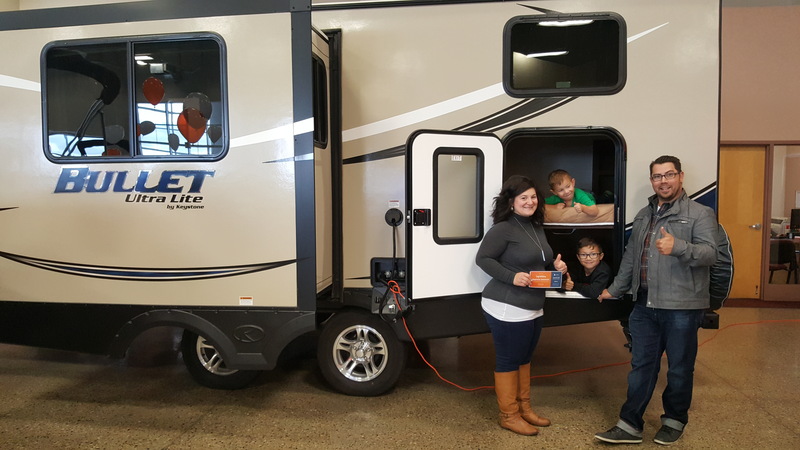 We’re excited to announce that Edmonton’s Stephania Desmarais and her family of four are the lucky winners of a free fully-loaded RV to use for a seven-day adventure whenever they choose! Stephania is a proud mom of two and a full-time teacher, so with summer coming to a close and school gearing back up, she decided to capitalize on her free RV and use it for a trip next summer. Stephania expressed how excited she was to have won. She and her family can’t wait to spend some quality time together camping (especially her two boys!). We can’t wait to see the pictures from their week-long adventure! Congratulations Stephania, we couldn’t be happier that such a nice, vibrant young family won! If you’re interested in future promotions just like this one, check out Go RV and Marine or like Go Auto on Facebook. Stephania isn’t the only person who’s won big in 2016. To read about our other contests and their winners, click here.